If you love Halloween then you probably love to entertain. I love both! Today the Sunday Supper family is partnering up with Gallo Family Vineyards to bring you the perfect drink, snack or dish for Frightfully Fun Entertaining! When your guests arrive why not offer them a fun beverage to sip on, a table full of delicious and fun foods and of course lots of scary snacks to pick on as you talk and dance the night away. When I entertain I like to serve an actual meal, I know I’m crazy but I like a few things to pick on and then a main meal whether it a be a hearty hot soup or stew, a bar of meatballs for make your own sliders , I’ve even made a Taco bar and everyone made their own tacos. I love nothing more than thinking of a really good theme for a party, having a signature to sip on and of course making food fun. Halloween is the perfect time to do just that. I suggest you go and check out GFV Frightfully Fun Entertaining recipes for some party inspiration. Where I live the end of October can be quite chilly. So I wanted to make a stew that could simmer all day but be fun come party time! I knew Gallo’s Merlot would be the perfect addition to this stew. I knew it’s blended flavors of black cherry, ripe plum and hints of oak would simmer great with the beef in this dish. You can click here to see what foods pair well with their Merlot. Can’t find it? I’ve got you covered, use their store locator. Don’t forget the $$COUPON$$ they so graciously gave us. Don’t forget to connect with Gallo now so you will always be kept in the loop with offers, recipes and MORE! Place the beef in a zip lock bag and pour the flour into the bag. Mix it around coating all of the beef as much as possible. Add the rest of the ingredients into a slow cooker, stir to combine and cook on low for 8 hours. Combine the 4 tbsp of flour with 2 tablespoons of water into a mason jar and shake to combine. Pour the mixture into the crock pot, stir and turn it to high. Let cook for 30 minutes to thicken. If it’s not to your “thickening” preference feel free to repeat this step again. I did it twice! Meanwhile, preheat oven to what the packaged biscuits state. Pull apart the biscuits and flatten them. Shape them into ovals rather than circles. Brush with melted butter and bake according to directions. Pull out a few pieces of the beef and cut into small pieces for the eyes and mouth of the ghosts. Insert into the dumplings and place inside the stew. Serve it in a cauldron for fun or right inside the crockpot. 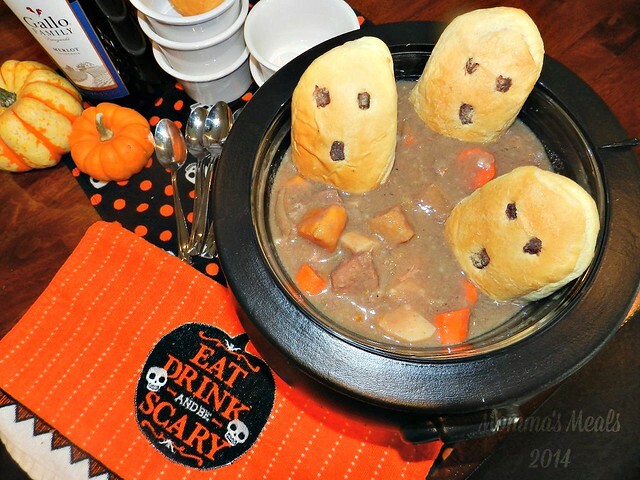 What you get is s delicious, hearty, scary & fun dish for your party guests! Let’s see what else the Sunday Supper family has brought to this party now shall we?! I adore beef stew, especially around this time of year. And the merlot would be so perfect in here! Plus those dumplings! Adorable! Those ghost dumplings are too stinkin cute! Plus the stew sounds perfect for this cold weather we’ve been having. Your ghost dumplings are adorable! Perfect garnish for a terrific Halloween stew! Ghost dumplings…. ha ha, so clever ! My husband loves beef stew! And what a great way to dress up the dumplings for Halloween!! It’s starting to get chilly in Maryland, too. I sure could use a bowl of this hearty stew. Love the ghosts! 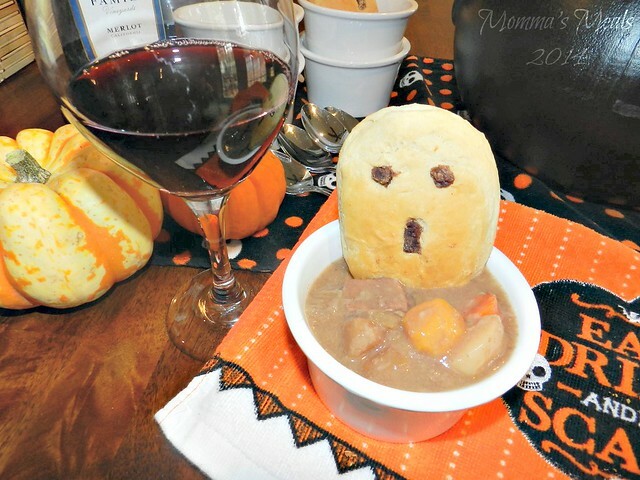 Oh I adore red wine beef stew, and those cute little ghost biscuits? So dang cute!! 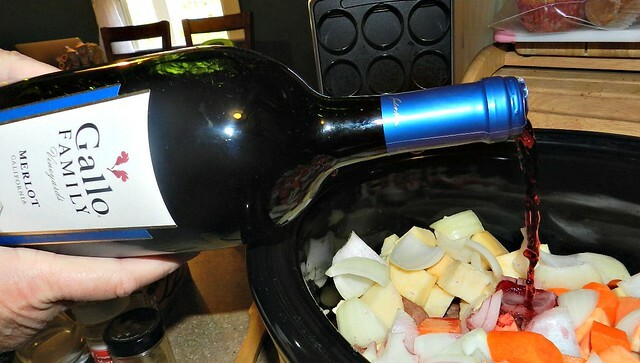 Merlot is the perfect addition to a hearty beef stew! And your ghosts are adorable! This sounds like the perfect Fall stew recipe to take the chill off at dinner time. Beef Stew is perfect this time of year! I’m ready for a big bowl of this stew! 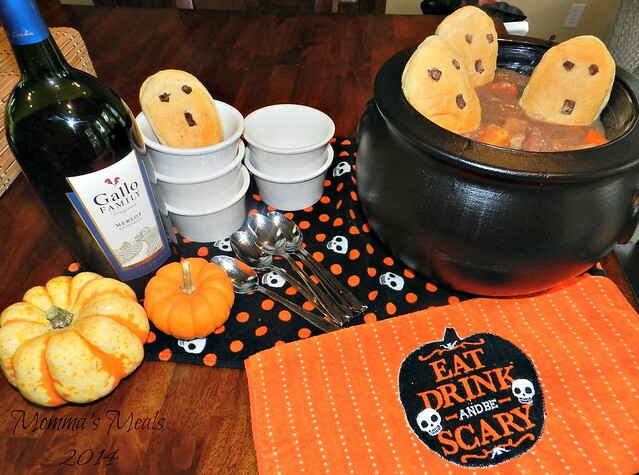 Not only does your stew look incredible, but I cannot get over how spooky fun those ghost dumplings are! Love this…those ghost biscuits are the perfect scary touch! I love stew…just waiting for Mother Nature to bring us some nice cool temps! Stew is so perfect for this time of the year….and those ghost dumplings are just TOO DARN CUTE!